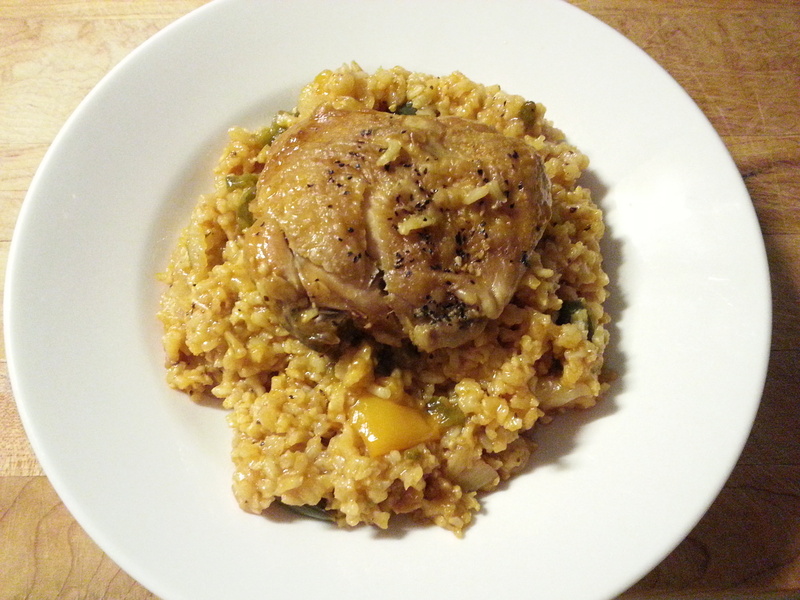 In English, chicken & rice, another good cold weather meal that makes the house smell so good and is relatively easy to make. So here we go. 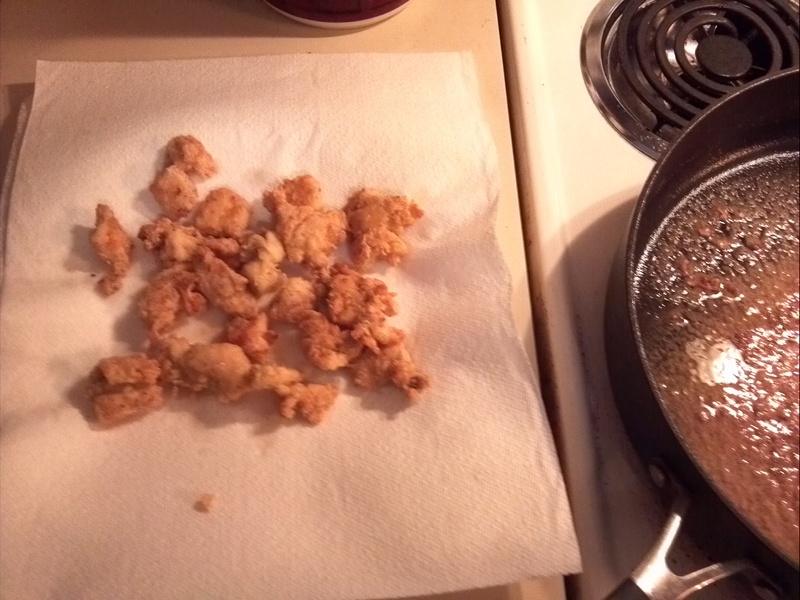 I started with bone in chicken thighs that I generously salted and peppered and cooked skin side down first in a heavy pot until golden brown and then took them out and set them aside on a plate for a few minutes. 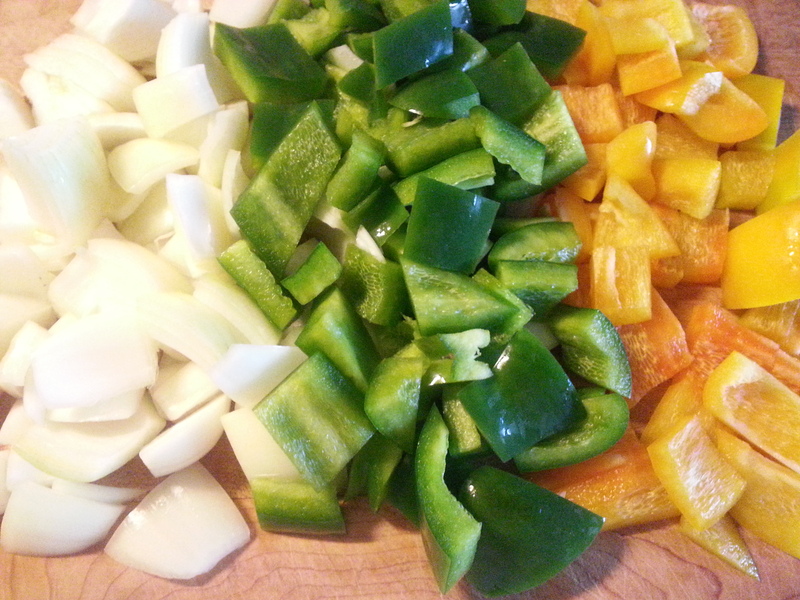 While the chicken was cooking, I cut up 2 medium onions, 1 of each green and yellow peppers into medium-sized pieces. 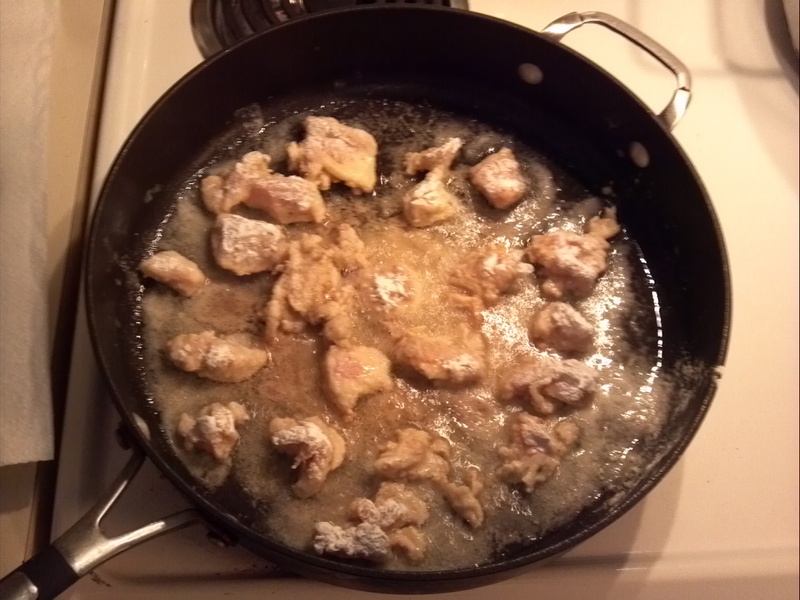 Once the chicken was out of the pot, leave the fat that has collected in the bottom. 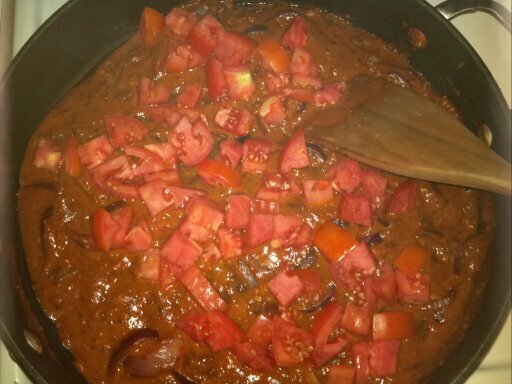 Add to it the onions and peppers plus two tablespoons of each tomato paste and chopped garlic and cook for about two minutes. 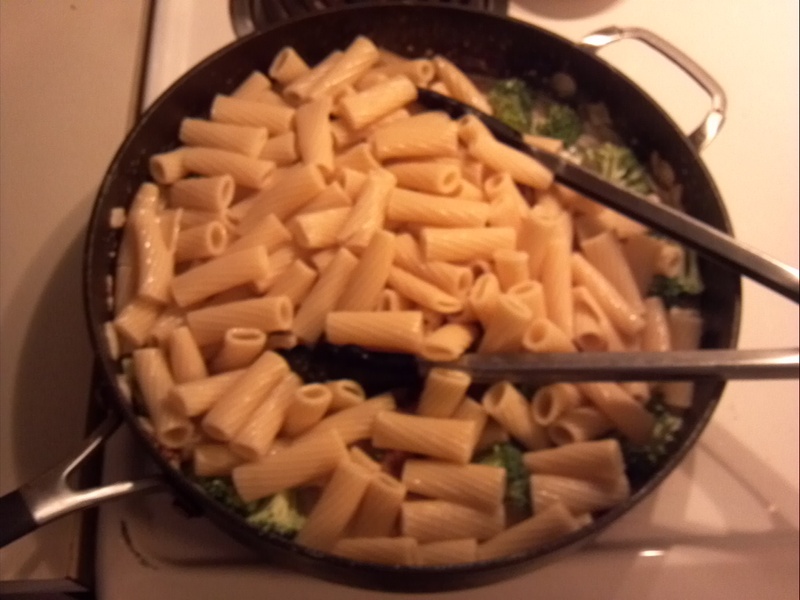 At this time I added 2 cups of brown rice instead of the usual white. 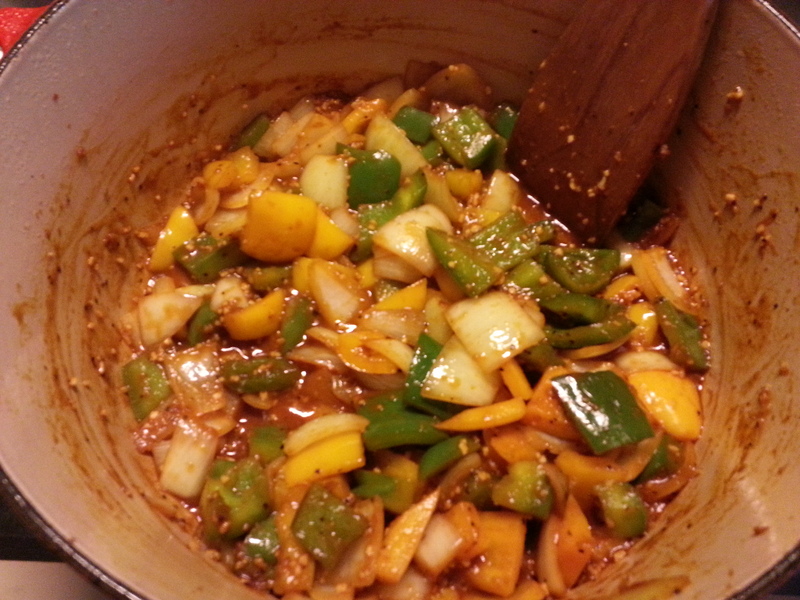 Now for the secret ingredient, I had some saffron in the cabinet so I threw in a very health pinch of it. 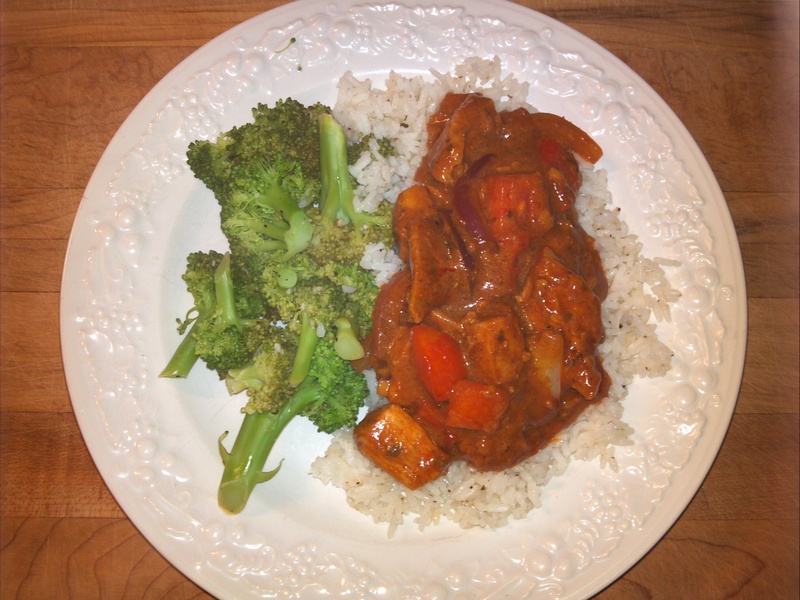 You don’t have to but it just gives the dish an indescribable flavor coupled with the brown rice. 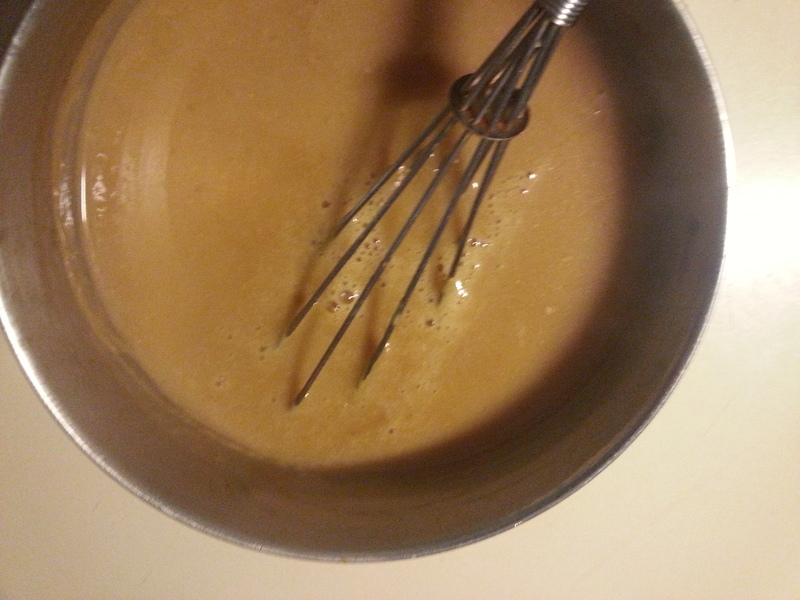 Now that everything is coated and stirred around with the oil from the bottom of the pot add your 5 cups of chicken broth and bring the pot to a boil. 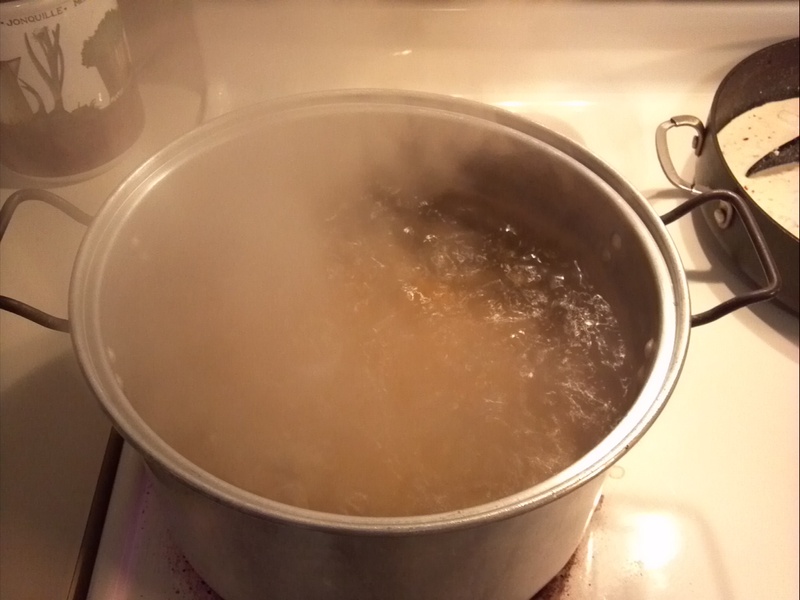 After it boils reduce the heat to a simmer and add the chicken back to the pot and put the lid on. 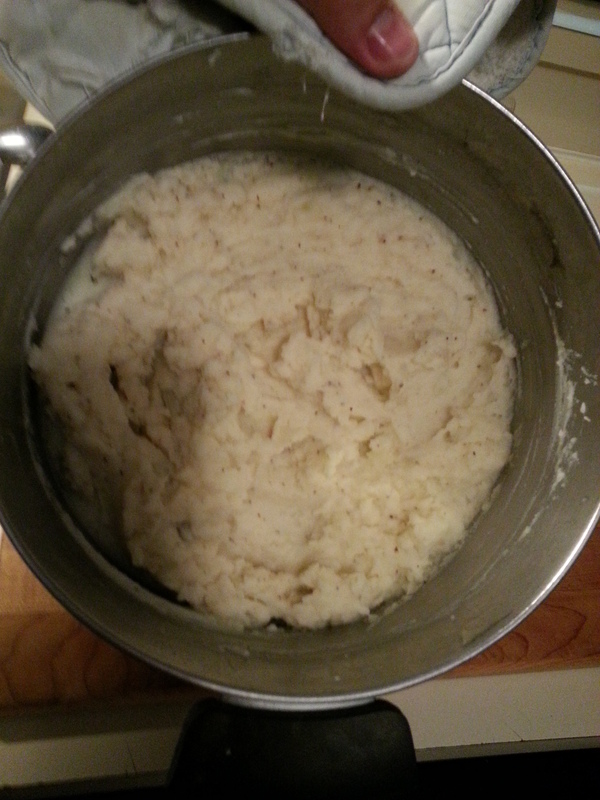 Now the hard part, you have to wait about 40 minutes or so until the rice cooks. 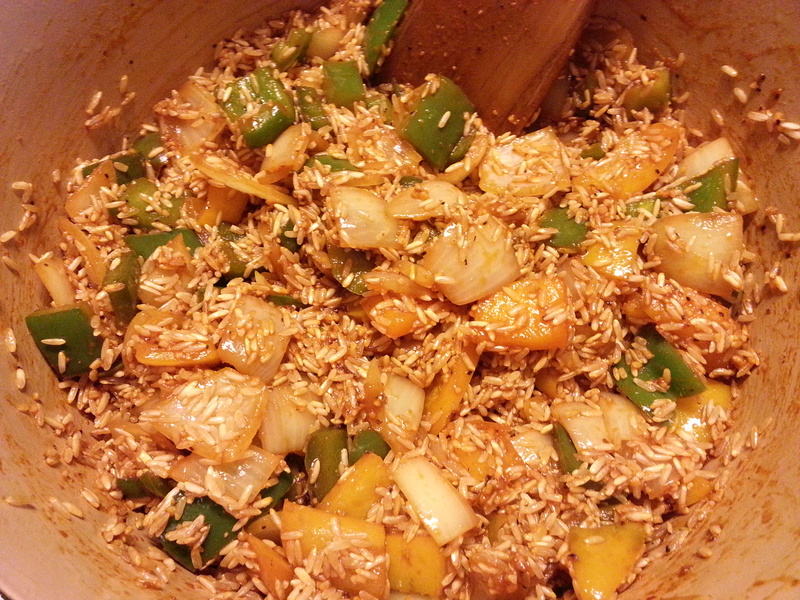 For the brown rice it takes almost an hour. Taste the rice to make sure it is done. 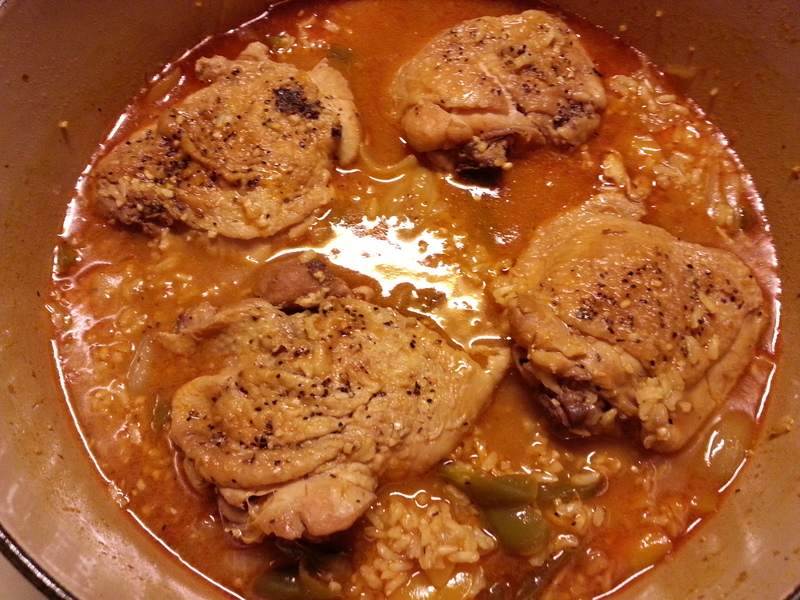 Also you will see the chicken resting on a bed of rice in the pot. By then the chicken is cooked all the way through. 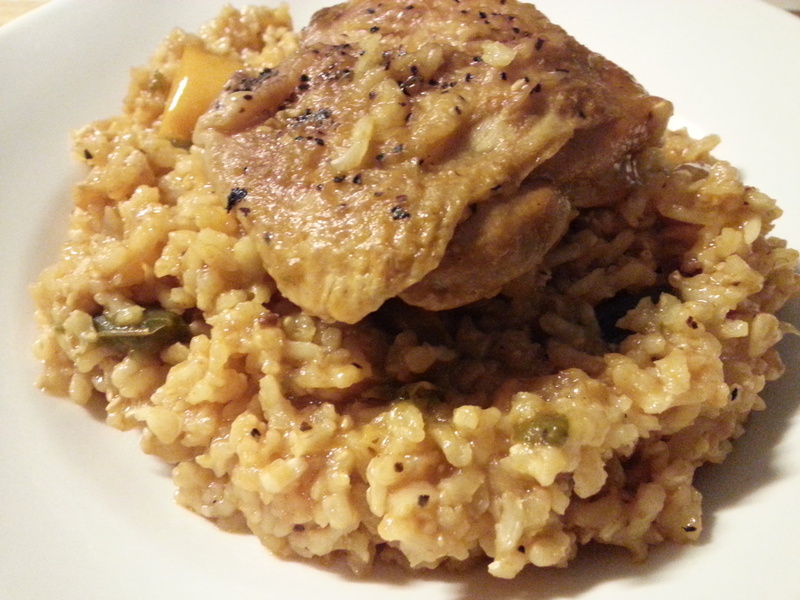 Here are few shots of the juicy chicken on top of a bed of rice with all the soft and flavorful vegetables mixed in. 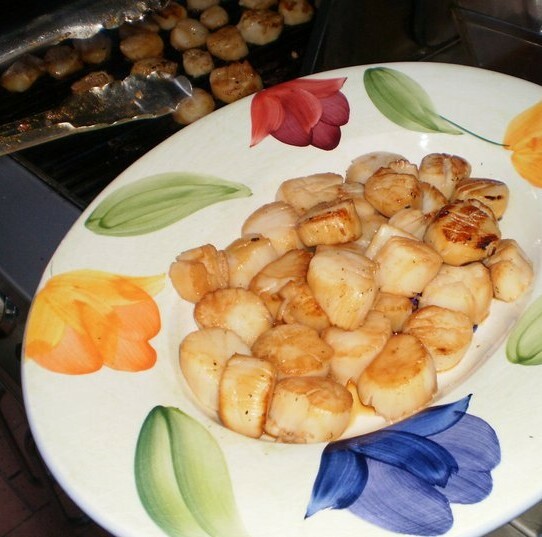 Go pour yourself another glass of wine and dig into the goodness. 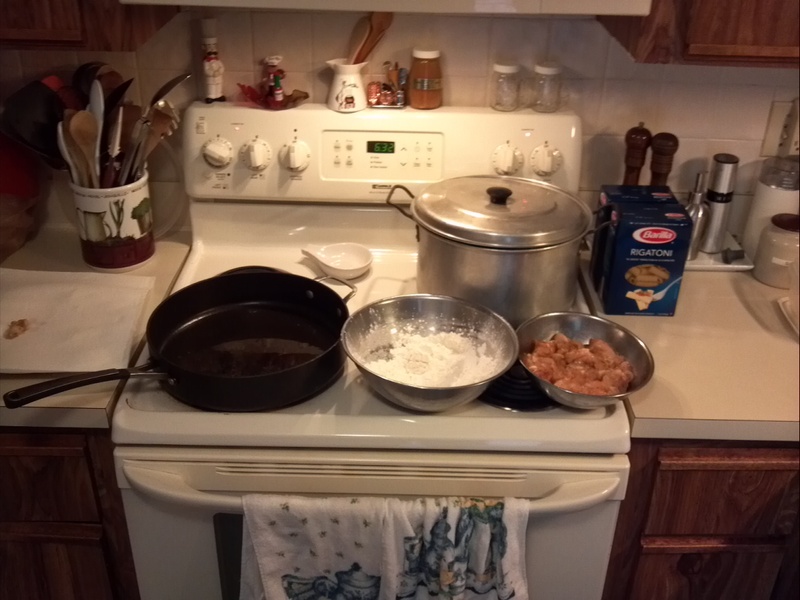 As you might have figured out by now I just can’t cook for the two of us. 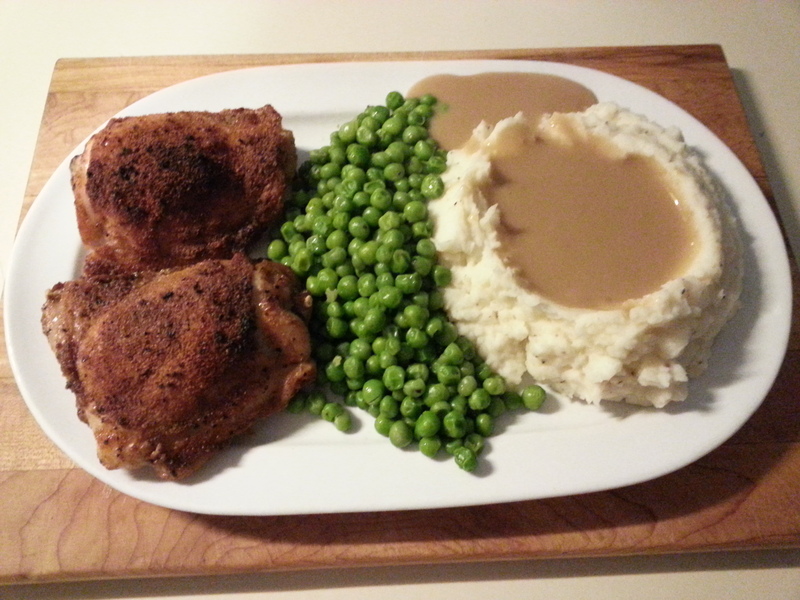 So we had some chicken thighs left over from earlier in the week. 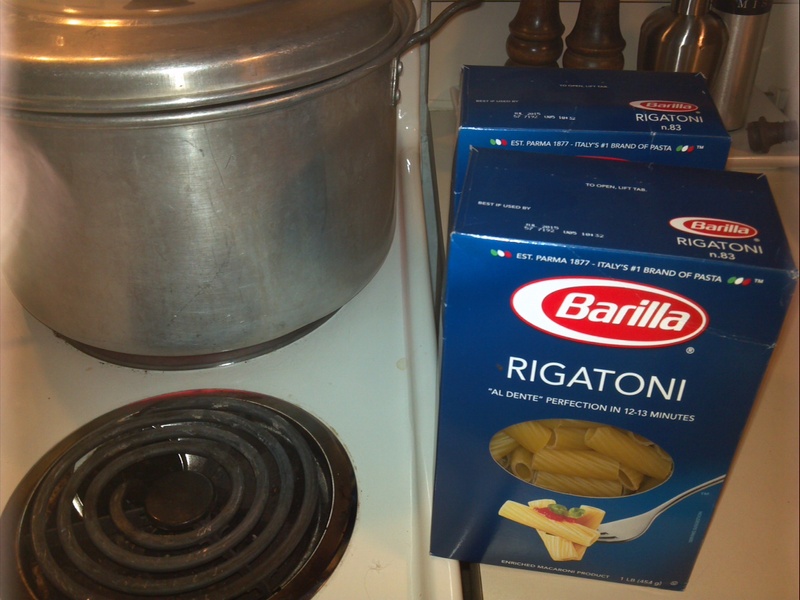 They were just the thing I needed to make a quick dinner. 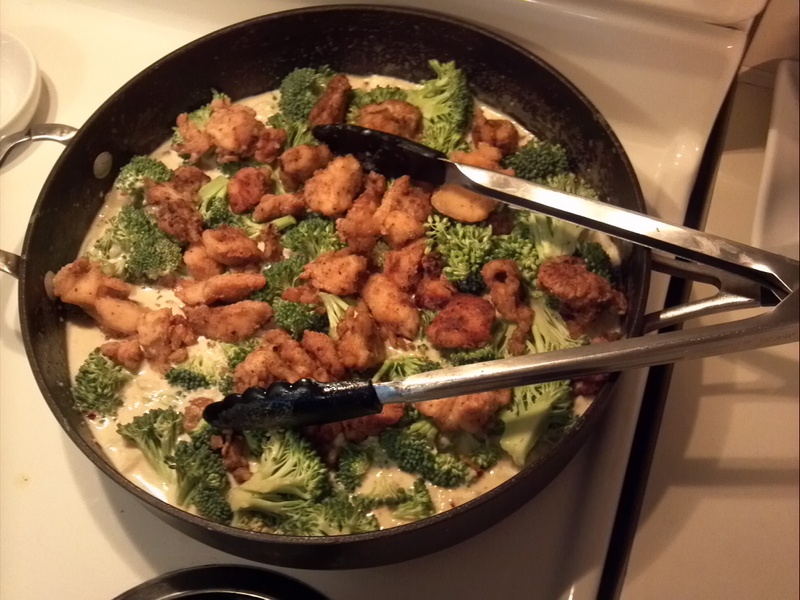 My wife and I both had hard days and I knew this meal would make anyone in her family happy. 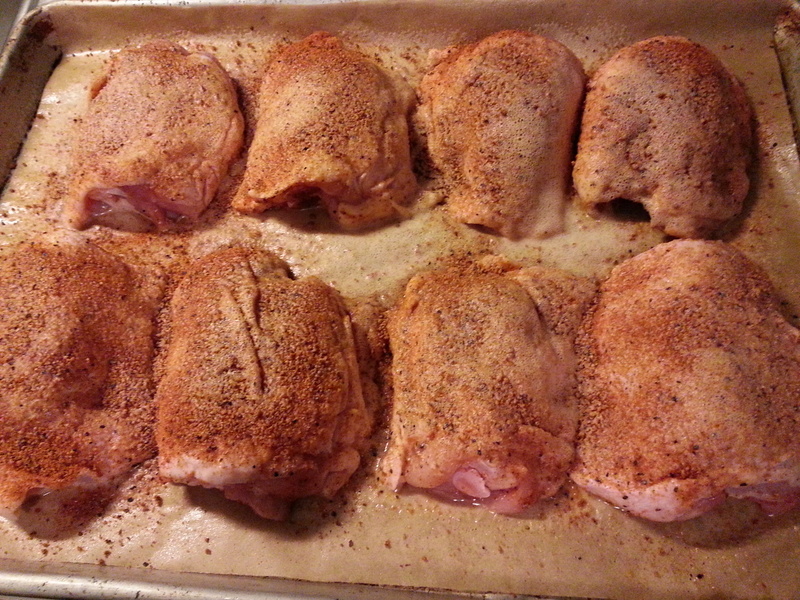 So here we go – turn the oven on to 275 degrees and let it preheat. 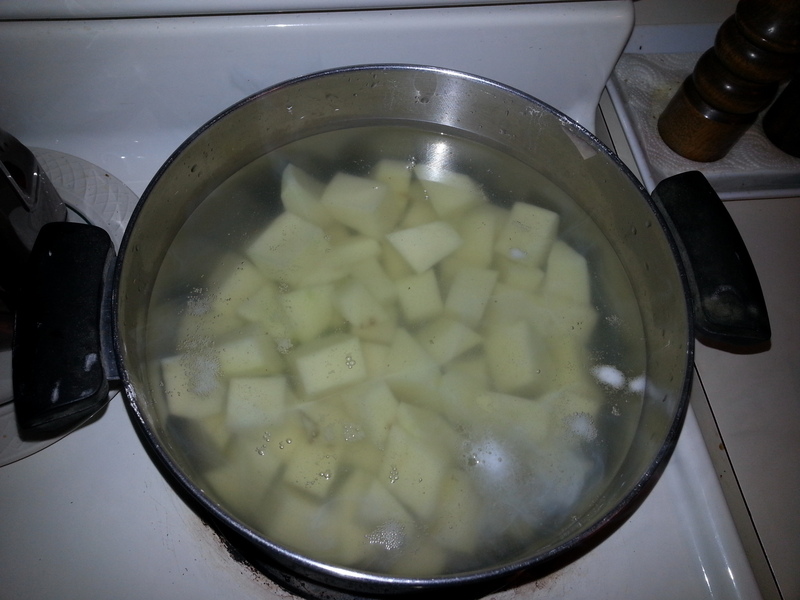 Take a pan out and place some aluminum foil on it, this step will help greatly with clean up. 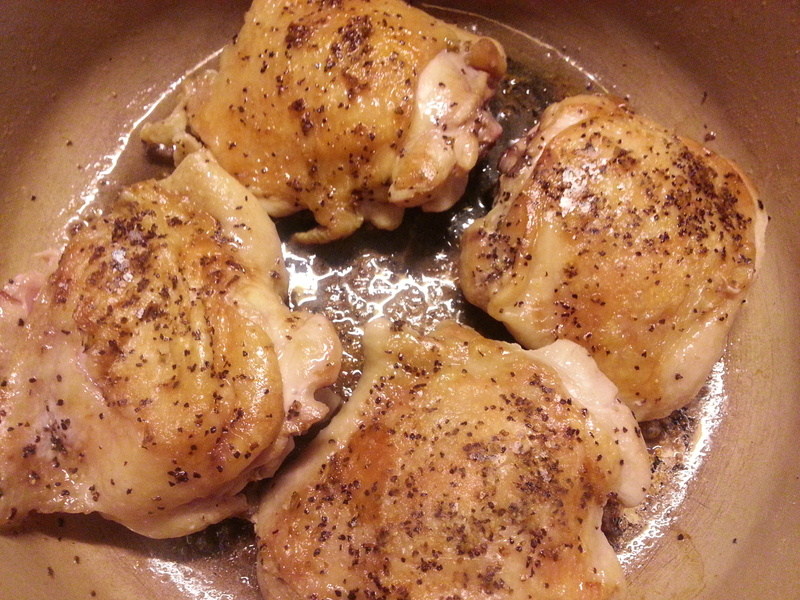 Put the chicken on the pan and let them hang out for a minute. 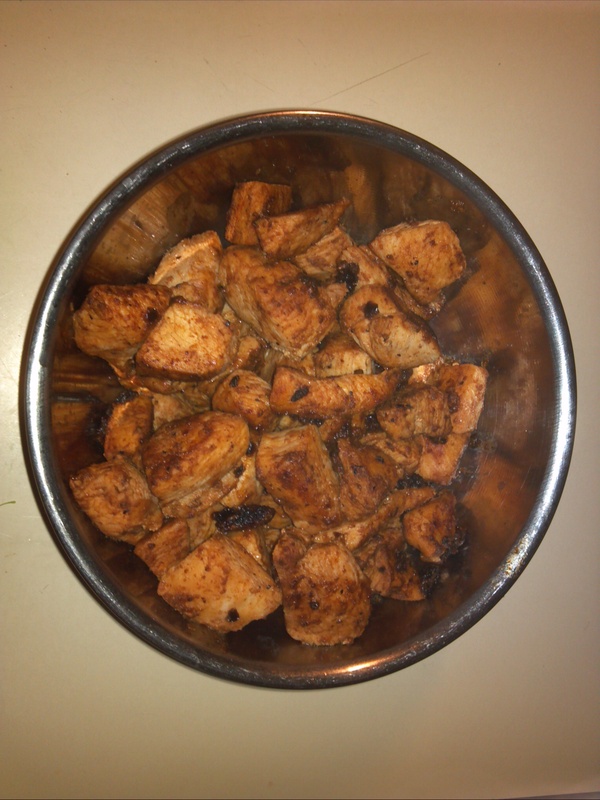 In a small bowl mix the following ingredients: tomato sauce, molasses, brown sugar, mustard, honey, Worcestershire sauce, chili powder, salt and pepper. Play with the flavors that work best for you. 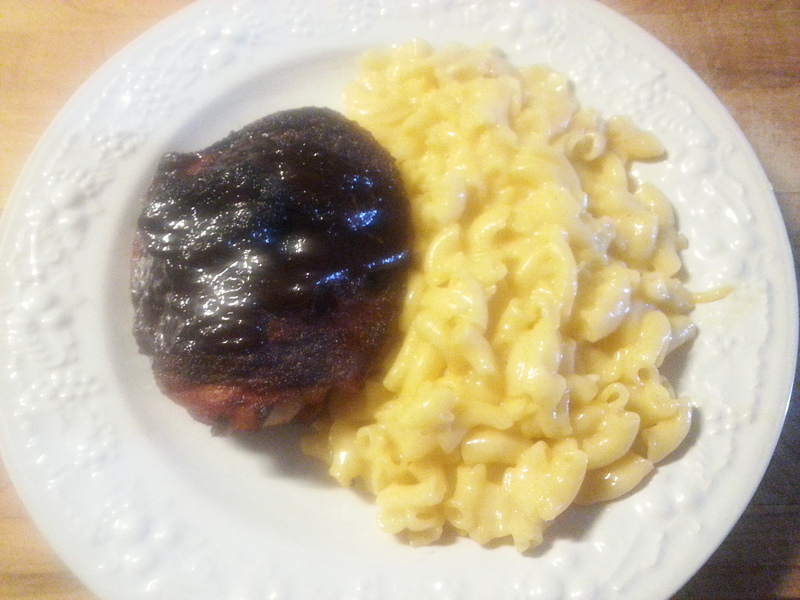 You could even use premade honey BBQ sauce, if you do, I’d recommend adding extra honey. 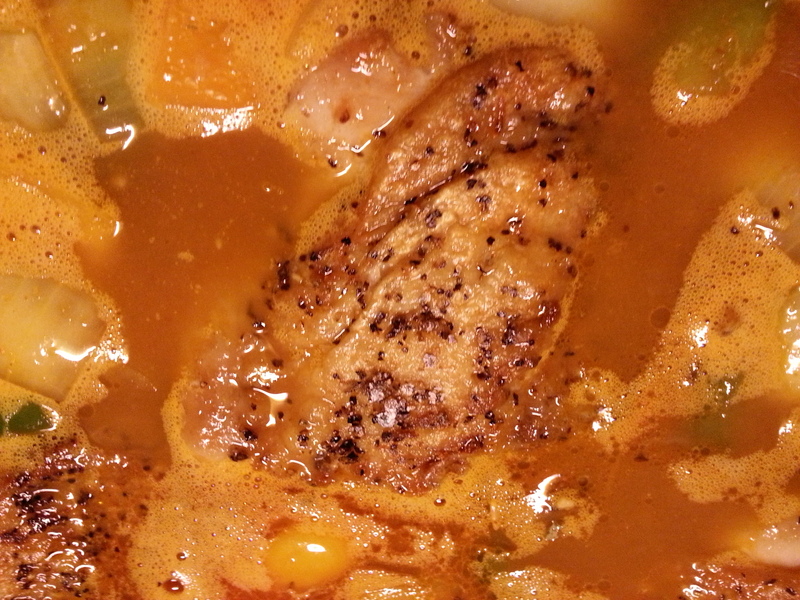 Carefully pour the mixture on the top of the chicken making sure to keep on the chicken. Put the pan in the middle of the oven and forget about it for about 30-45 minutes. 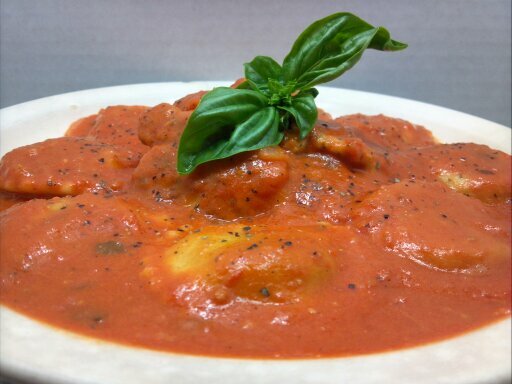 During the week sometimes you need some comfort food quickly. This time I reached up into the pantry and grabbed a couple of boxes of elbow noodles. 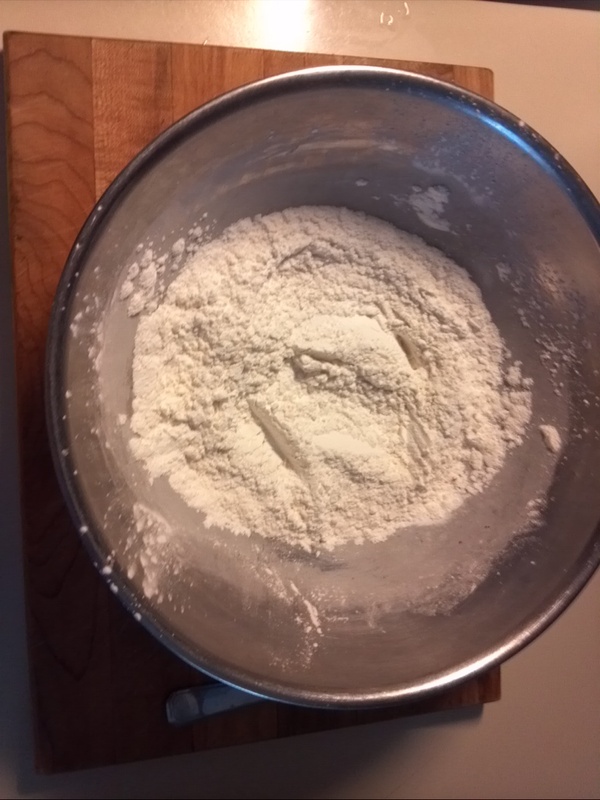 I made a rue with butter and flour, then added about 2 cups of milk along with pepper and some chili powder. 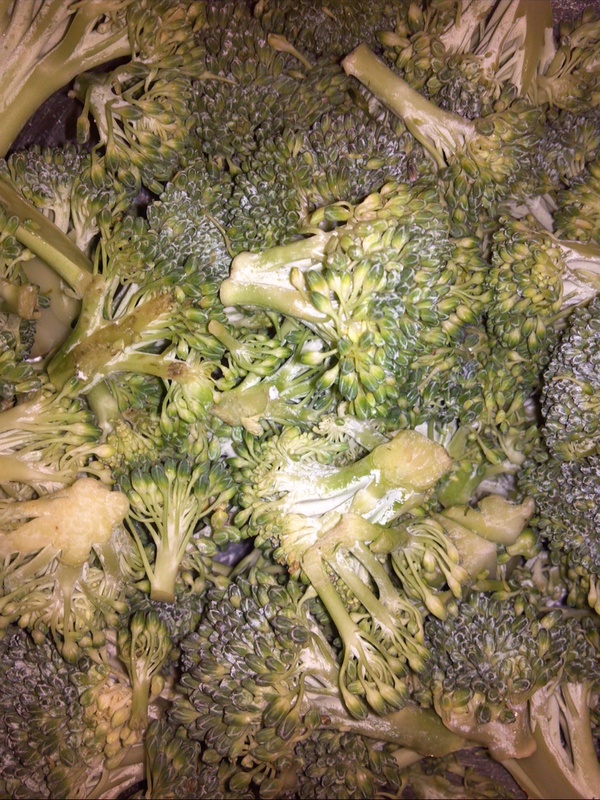 Stir on low heat for a couple minutes, then add in 2 cups of shredded cheddar cheese. We make mac-n-cheese often and will experiment with different spices and cheeses. 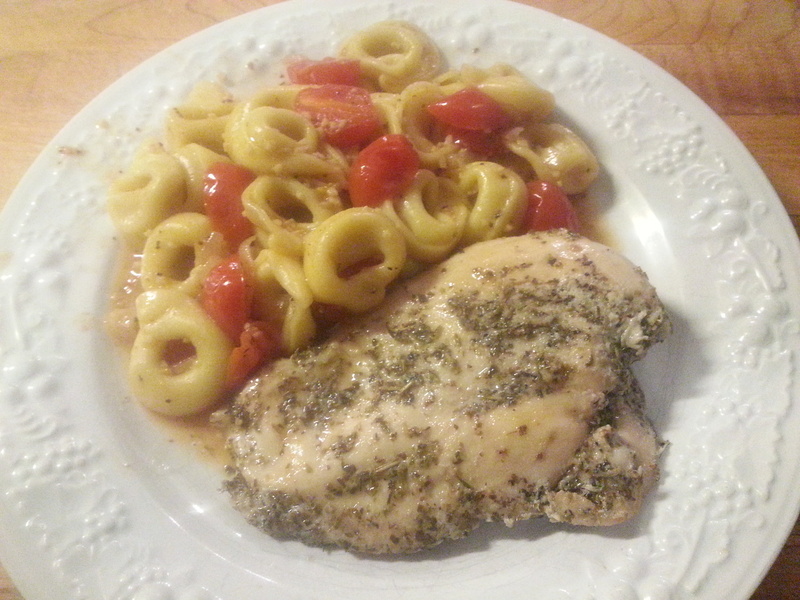 Chicken can get boring, sometimes doing something completely different can add some variety. 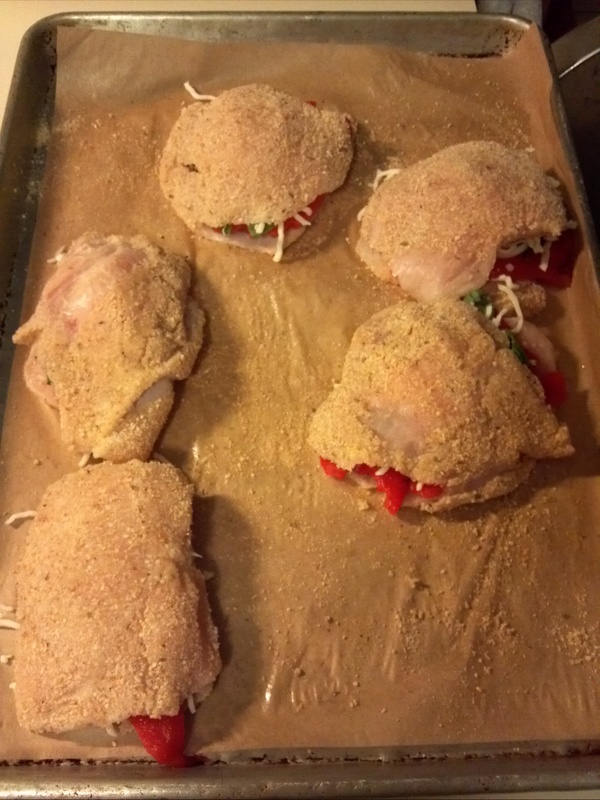 You can stuff chicken breasts with any of your favorite ingredients. 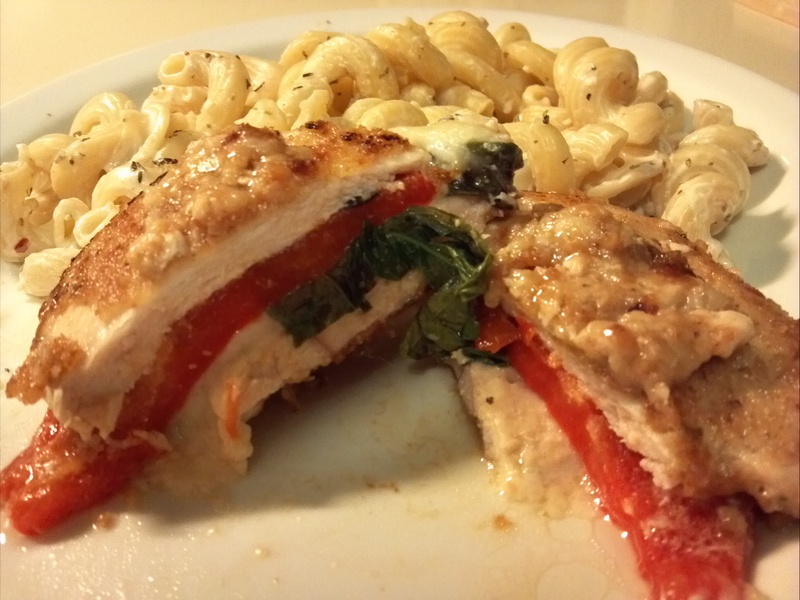 Fresh roasted red peppers offer a great flavor to this particular dish. 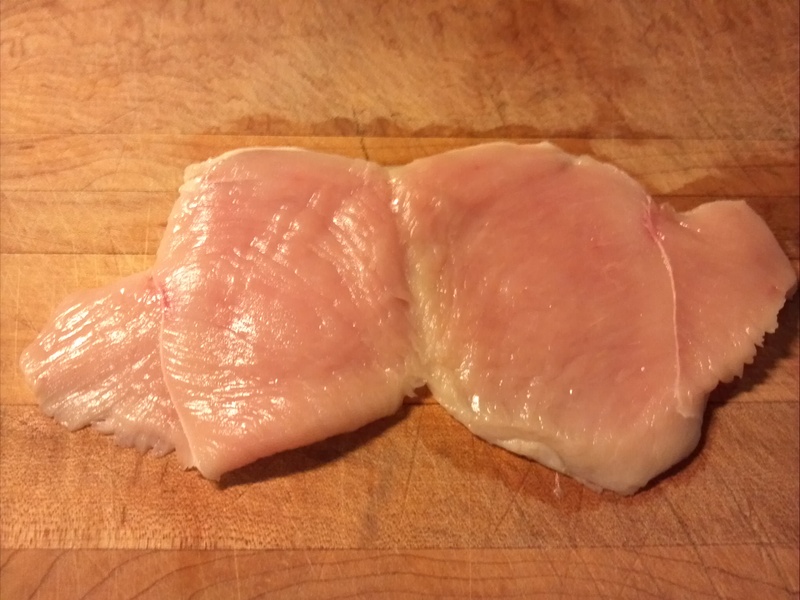 Take the chicken breast and butterfly it. To do that, cut it in half horizontally. Do not cut all the way through. Leave at least on end attached. 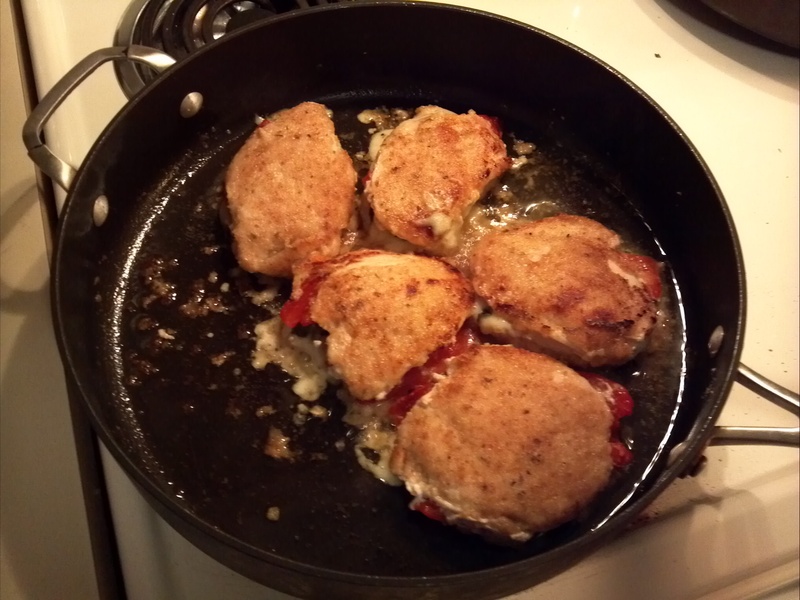 Add the garlic to the chicken breasts. 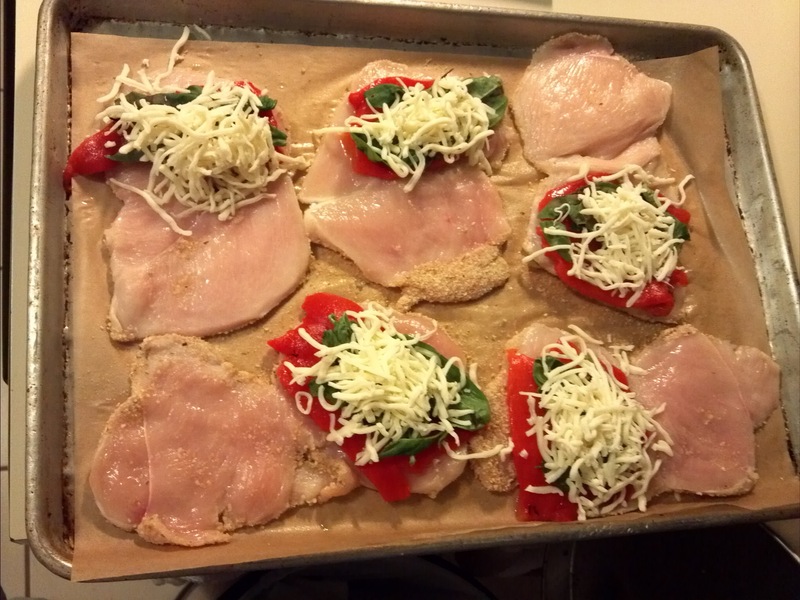 Layer in the roasted red peppers, basil and mozzarella. 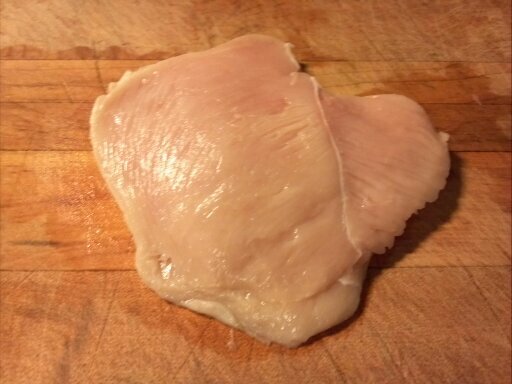 Fold the chicken back together, like a sandwich. 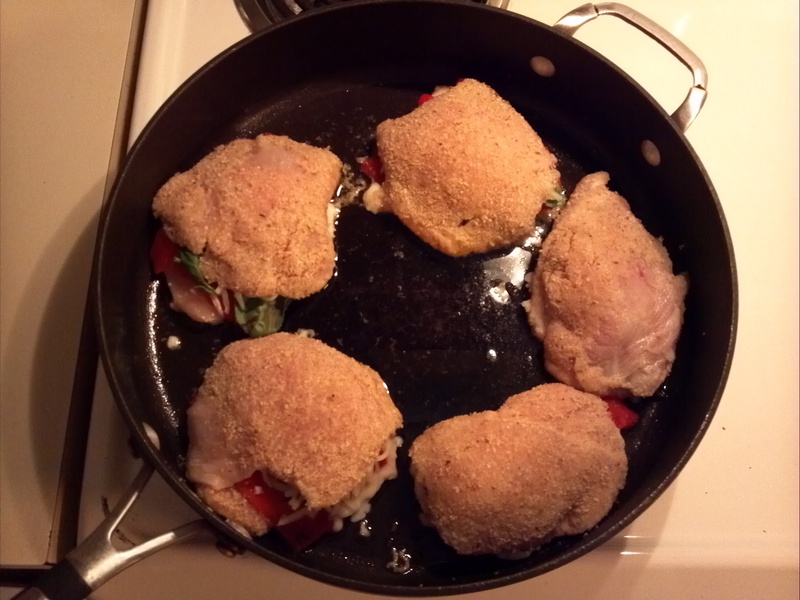 Carefully coat both sides of the chicken with the seasoned breadcrumbs. 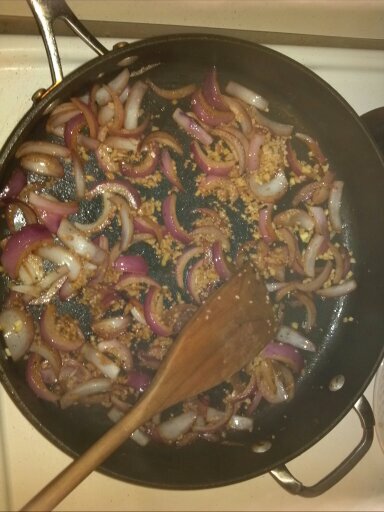 Preheat a heavy bottom pan on medium low heat with oil. I used a Mediterranean oil, which was a mixture of olive oil and canola oil. 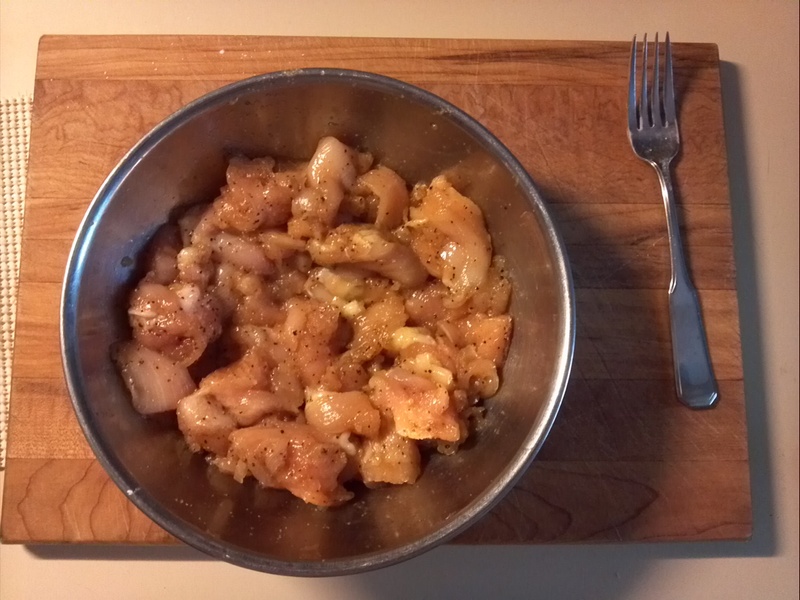 Cook the chicken on medium low heat until golden brown. 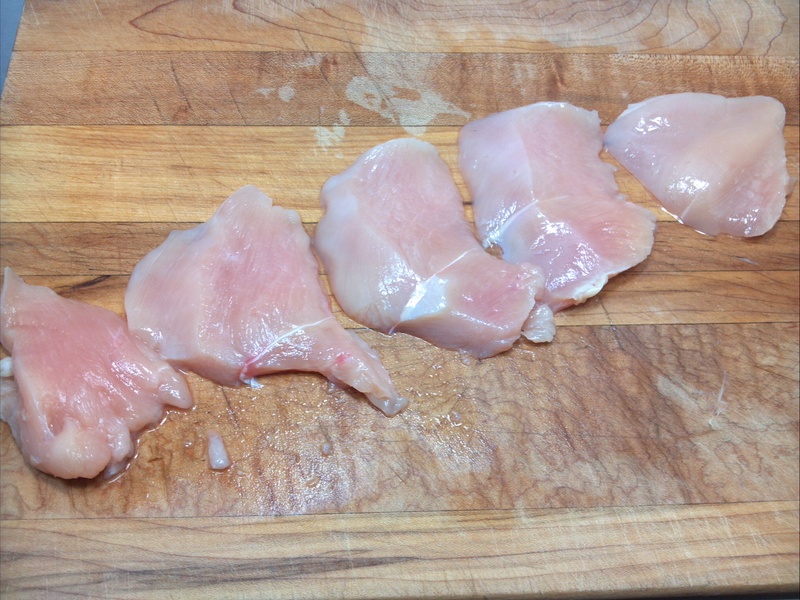 Because the chicken was thinly cut, each side should only take 4-6 minutes. 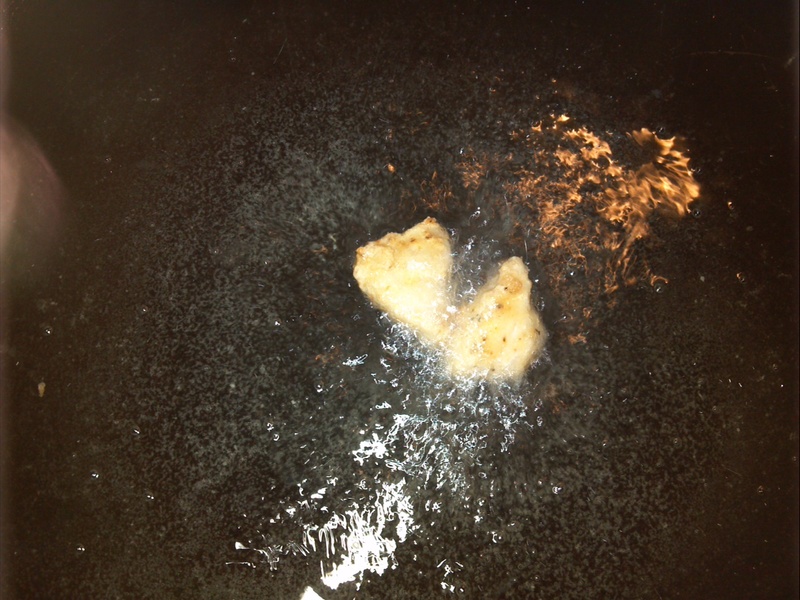 Flip the chicken over and cook the other side to a golden brown. 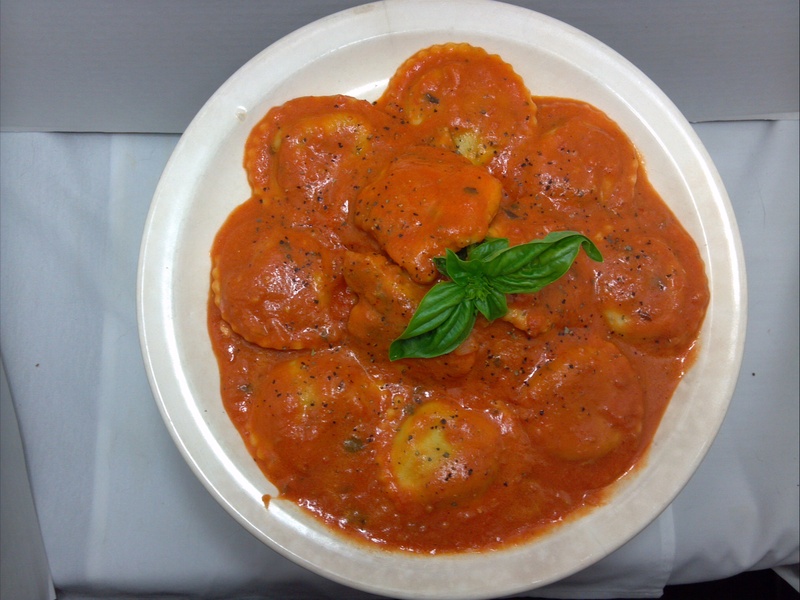 Serve with some of your favorite pasta. 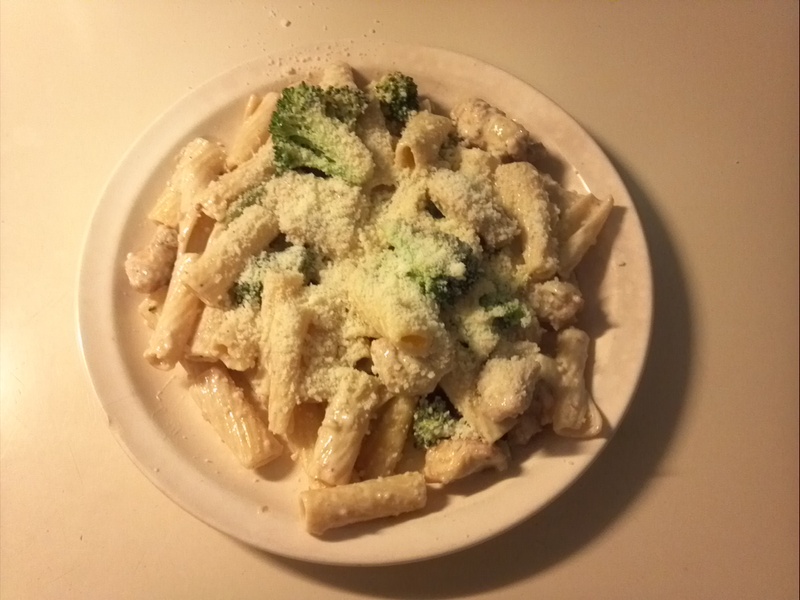 Here I tossed the pasta with garlic, Parmesan cheese, cream and black pepper.